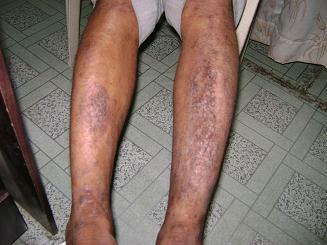 A Case of Psoriasis who has taken many treatment till now from Allopathic Skin specialist, Ayurvedic Physician. Bo treatment has given him satisfactory results. He has applied several local steroidal ointment & medications but no permanent results. After tired of all these treatment then he came to me for Homoeopathic advise. Silvery scaly Eruption over anterior surface of both Leg, elbow, chin, forehead, on abdomen, sacral region. Oozing from scaly eruption of the leg. Watery stool < morning, eating after. Pain in extremities. < rising from bed. Thirst: Frequent every 1 hounry. Perspiration of palms & Soles. Stool: 4-5 times per day. Sleep: Normal. Sensitive to noise. Scaly eruption over both leg with oozing. Scaly eruption over elbow. Abdomen, sacral region. Improvement in Frequent urging for stool. Swelling of soles < morning, motion. Rhus Tox 30 2 doses given for bodyache. Aching in extremities slight less. No compliant. There is slight pain in extremities due to atmospheric changes.